QVC and HSN, watch out. Amazon Live is in the house. The retailer has unveiled a new video shopping channel featuring the “latest deals” and streams from other brands sold on Amazon.com. 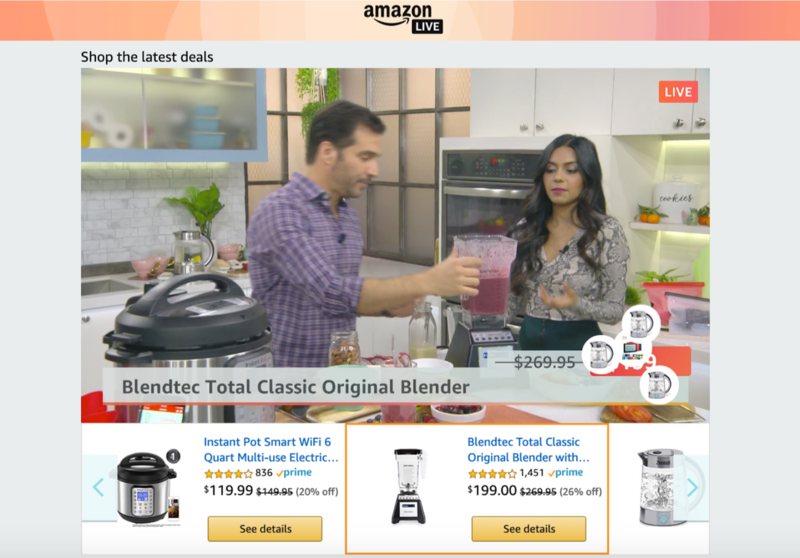 Amazon Live hosts demonstrations of products across various categories (expanding beyond the categories previously featured on Style Code Live, Amazon’s live fashion and beauty-focused show that was discontinued two years ago). Viewers can then browse through a product carousel at the bottom of the video and instantly purchase products as desired. Viewers can also go back and shop archived live videos on the site. Amazon Live is currently available on the web, but we expect that it will soon be available on Amazon Fire TV and, eventually, a cable television network following reports that the company is bidding for cable channels. Read More: “How to Get Your Brand on Amazon Live"
Forbes challenged the novelty of this move by Amazon, pointing out how Alibaba and “numerous other” Chinese ecommerce platforms have been investing in live-streaming for several years now. For example, in 2018, 84 stores on Alibaba-owned shopping website Taobao reported $7.4 million in sales each through Taobao livestreams. Taobao predicts that live-streaming will generate over 500 billion sales transaction in the next three years. Furthermore, the site already employs its own influencers—81 of whom generated over $15 million in sales total through live-streaming. “Live-streaming is not just a feature. In the future, it will be the mainstream ecommerce model,” Taobao CEO Jiang Fan once said, according to Forbes. It appears that Fan’s prediction is not only coming into fruition, but underscoring the power of content and community in generation trust. As today’s consumers are becoming savvier with online shopping, brands and sellers become more at risk of losing sales to competitors or abandoned carts. Consumers will often visit multiple sites to research product features, quality, reviews, deals, or the brand itself. A finely-tuned product description by itself won’t win you a sale. Live-streaming can help to alleviate consumer doubts and build brand trust. Not to mention, it can serve as a powerful tool for educating customers who are green to any industry. Has your brand experimented with live video or Amazon Live? What results have you seen? Tweet us @ZentailCommerce with your story! Learn how to check all the boxes in your merchandising and product marketing efforts. Great sellers think like buyers, do you think like your customers? During unboxing, online sellers have a unique opportunity to collect favorable product reviews. This is a perfect example of a review-worthy packing insert.